It’s 15 years since the Service Profit Chain first demonstrated the causal link between employee engagement and business performance. Why, then, are so many organisations still so bad at doing it? Kevin Keohane, global head of brand and talent for MS&L (part of Publicis Groupe), argues that it’s mainly a failure to join things up. The Talent Journey presents a whole systems approach to brand and employee engagement, looking at how organisations can better communicate with people before, during and after their association with the enterprise. Full of no-nonsense ideas and tips for getting it right (and how not to get it wrong!) 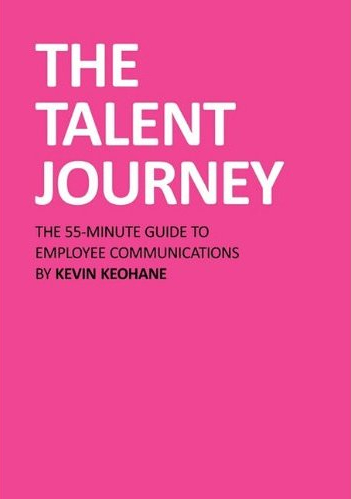 it’s a quick and deceptively simple guide to why internal communications is dead, but people communication is alive and well. Kevin is a business consultant who specialises in organisational communication. He has spent more than 20 years in the field of brand and employee communication. Currently, Kevin is a Partner at BrandPie, an agency of creative strategists specialising in brand Positioning, Identity and Engagement. Previously he built and led the Publicis Groupe’s Brand & Talent practice, a unique global network-within-a-network of agencies specialising in employee communications from its London hub, SAS. He writes a widely-read blog called Death To Internal Marketing and co-founded CommScrum. His clients have included some of the world’s leading organisations, from American Express to Barclays to BP to BT to Coca-Cola to GlaxoSmithKline to HP to KPMG to Orange to Shell to Vodafone and beyond. He is passionate about Triumph motorcycles and enjoys track days or long rideouts, in addition to a thrilling daily commute through Central London taking him past Parliament, Big Ben, Buckingham Palace and Hyde Park twice a day. In his spare time he’s also a songwriter and bass player (www.brandviolet.com). Feel free to get in touch on LinkedIn.